Discoveries of natural flora, fauna and phenomena are not necessarily straightforward things. The discoverer may wish to conceal the source. The discoverer may also have various motivations. In certain grave instances, the entire claim might be fabricated. Piltdown Man, discovered in a gravel pit in England in 1912 by amateur archaeologist Charles Dawson, was celebrated as an ancestral link to humans. In 1954, with the application of dating methods, the discovery was designated a fraud. A human skull had been cleverly paired with an orang-utan’s jaw. The quest for the Australian Night Parrot remains one of the stranger tales of the naturalist meeting the professional researcher; the skilled amateur in battle with establishment practices; the vainglory efforts to seek a place in the birding pantheon. An entry on the site Bush Heritage Australia gets the description of the bird to a flying and enthusiastic start. “The Night Parrot (Pezoporus occidentalis) is one of the most elusive and mysterious birds in the world. This nocturnal and mostly ground-dwelling parrot is endemic to Australia but for around 100 years it was feared to be extinct. Incredibly, we now have a second chance to save it!” As has been remarked, this particular bird has been Australia’s Ivory-billed Woodpecker, driving ornithologists professional and amateur to the edges of sanity. Then came the moment and the initial, gasping thrill. In 2013, Queensland naturalist John Young rediscovered the Night Parrot, first found in 1845. (There had been, prior to that, a road-killed specimen in 1990 in western Queensland, and a headless sample to the south-east in 2006, found on barbed wire.) Young, however, was cautious. Locations were kept secret; exposing the sites might led to over enthusiastic twitchers finding their way to the area, disrupting the environment. Evidence, caught on video and photos, would be shown to the anointed, an all invitation-only gathering. He was keen to push the scale of the discovery: two pairs of Night Parrots, and a nest with three nestlings. Young, however, had a history, one weighed down by naturalist half-truths and a persona of perceived quackery. Through the 1990s, he survived on funding from anaesthesiologist Tom Biggs and his wife. This enabled him to pursue his roving adventures through Young Wildlife Enterprises, a company he established to produce films, run tours and identify rare bird species. He spent time pursuing gigs for conservation, propelling, for instance, the move to establish TYTO Wetlands, thereby saving the Crimson Finch and Eastern Grass Owl. The 2013 discovery seemed like an atonement, and his show to the selected guests at the Queensland Museum in Brisbane was akin to a ritual cleansing. Money followed, ironically enough from a mining company Fortescue Metals Group, to study the bird’s ecology and document its behaviour. Young was picked, working alongside conservation ecologist Steven Murphy in a collaboration of some friction. Murphy, for one, thought Young’s methods free of science, a wildlife buccaneer lacking method. Young was subsequently given free rein by the Australian Wildlife Conservancy to find and document rare bird species on the organisations properties, something akin to an environmental janitor. Then, the millstone of history seemed to tug again. Hanging heavily, there seemed to be problems. Old pictures were revisited. Did Young actually place a mesh around The Night Parrot he photographed in 2013? Were the pictures taken at a time the birds were not active? Murphy was particularly riled by Young’s doctoring of one photo where damaged feathers, occasioned by the capture, were removed. Then came specific allegations regarding Young’s work for the AWC. The material in question featured a Night Parrot feather, found at Kalamurina Wildlife Sanctuary, South Australia; a Night parrot call recording, downloaded at Kalamurina from an acoustic monitor; and Night Parrot nests and eggs supposedly found at Diamantina National Park, Queensland. The independent panel’s findings were damning on all three items. It transpired that the feather in question, whilst being that of a Night Parrot, said to be the same one sent by AWC to the South Australian Museum, was different and therefore not conclusive of its existence in Kalamurina. 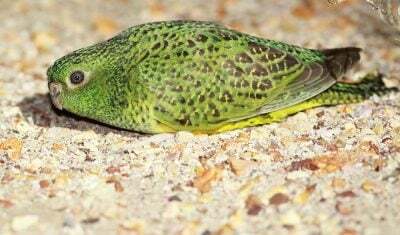 Night Parrot calls published by the AWC from recordings made in September 2018 purportedly taken at Kalamurina were actually derived from publically available material from a Western Australian specimen, not a local one. As for the discovery of eggs and nests, a majority of consulted experts (eleven individuals including nine ornithologists) concluded that the eggs in one nest could not have been natural. Works such as David Goodstein’s On Fact and Fraud: Cautionary Tales from the Front Lines of Science (2010) show scientists as fallible creatures prone to careerism and the posterity disease. Discovery lust can muddle a scientist’s integrity, a point encouraged by what Goodstein calls the Reward System and the Authority Structure. Rather than being high priests of fairness and objective research, they are as susceptible to manipulation and deceiving as any group. The difference here is they do not necessarily see it in that light. In that cosmos, merit and manipulation can be seen to go hand in hand. The injection of “falsehoods into the body of science is rarely, if ever, the purpose of those who perpetrate fraud. They almost always believe that they are injecting a truth into the scientific method.” Robert Millikan, for instance, manipulated his data, not so much to deceive as to reach the most accurate value for the charge of the electron. Young, in addition to his attempt at redemption, can be said to have some something similar, with his compulsive touching up of images, and his denial that he had captured the birds in question. Young’s greatest trickery was one played upon himself. The others, for a time, fell into his orbit, and even then, with some scepticism. He was never particularly good at maintaining a front for long. But for all that, there was enough to front the claim that The Night Parrot had been found, tantamount, as the editor of Birdlife Australia suggested, to “finding Elvis flipping burgers in an Outback roadhouse”. A salutary tale to any future discoverer of the remarkable and doggedly elusive, and the dangers that entails.